Montreal (AFP) - A first half Andressa Alves goal booked South American giants Brazil their ticket to the last 16 of the Women's World Cup with a 1-0 win over Spain. Brazil become the second team to advance to the knock-out rounds after defending champions Japan secured their berth on Friday night. Marta on Saturday nearly added to her record World Cup tally of 15 goals on 43 minutes off a corner. But the star of the night was Alves, who pounced on a defensive error by the Europeans a minute later to keep the 2007 runners-up unbeaten after their opening 2-0 defeat of South Korea. The tenth international goal for the 23-year-old midfielder put Brazil top of Group E with six points from two games. "We didn't score big but we won the game. It's good for us to know we're in the next round," said Brazil coach Vadao. "The first half was very hard work. We weren't able to penetrate the field. The play was broken and didn't flow. "But Andressa read the game well and her perseverance gave us this win. "We've made it to the next round so we can afford to save some of the players who were complaining about aches and pains in the next game." Costa Rica are second in the group after a 2-2 draw with South Korea on Saturday, and next play Brazil on Wednesday. Spain, who drew 1-1 in their opener with Costa Rica, have one point along with the Koreans. Newcomers Spain did not seem intimated by the experienced Brazilians early as they kept the South American forwards at bay for most of the first half. Spain's Natalia Pablos had their clearest chance on seven minutes when alone on front of goal, but her diagonal shot was off target. Brazil were cheered on by thousands of their fans in a colourful display at Montreal's Olympic Stadium. The fans screamed at each approach to the net by the Spaniards which was frequent in the first half with Marta barely getting a touch on the ball. 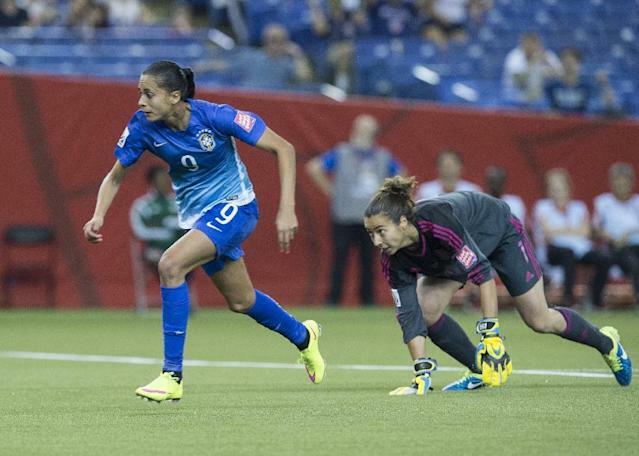 Spain's Marta Corredera shot after 13 minutes deflected off Brazil defender Rafaelle but went past the post. But Alves got the winner just before the break when she picked up a loose ball beat Spain keeper Ainhoa Tirapu. 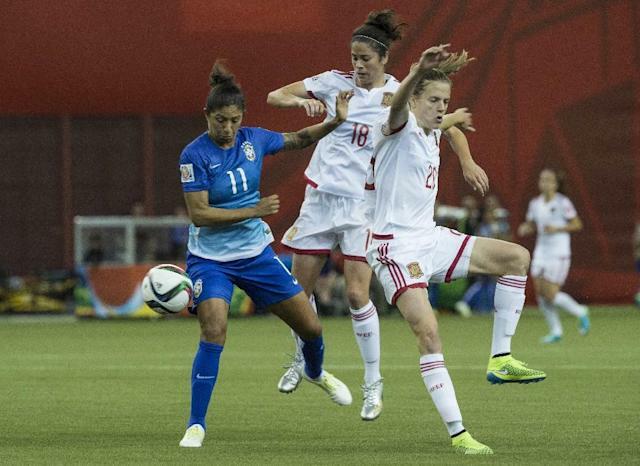 "It was a bad time to concede a goal – it was a real psychological blow," said Spain coach Ignacio Quereda. Alves nearly completed a double after the break with a powerful long-range drive only for Tirapu to send it over the crossbar with the tips of her fingers. Marta set Formiga fifteen minutes for time only for the veteran to put her shot wide, with Spain captain Veronica Boquete and Irene Parades both missing chances to grab a point in the dying minutes. "It seems we have no luck when it comes to scoring," said Quereda. "After two matches we just have one point. That is an accident because we're having no luck whatsoever. "We were playing against an amazing team who have a lot of experience." Quereda predicted an "intense" match against South Korea. "They are in the same boat as we are," Quereda said.